Josef Albers is the guy you can blame for all those comparisons of colored rectangles within colored rectangles. "Is this the same color?" Invariably yes, but it never looks the same because the color surrounding it changes your perception. Editing an image presents the same problem. Your image is the interior rectangle and your perception is affected by the color of the bounding rectangle. We don't want to mention Albers without quoting the Yale professor's Interaction of Color, in which he called color "the most relative medium in art" because it "is almost never seen as it really is -- as it physically is." And the book is full of examples. But he starts by comparing the "haptic sensation" of putting your hand in each of three pots of water of different temperatures: warm, lukewarm and cold. Dipping your hands in the outer pots, one feels warm and the other cold. Putting them both in the middle pot makes one feel cold and the other warm "though the water is neither of these temperatures, but of another, namely lukewarm." The same sort of thing happens with adjacent colors. Let's take a recent image we published as an example. 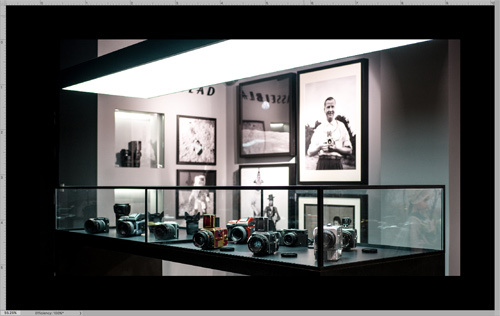 It's a high contrast color interior shot of Hasselblad's new store in Shanghai. In the first three of the four images above, you can see how the same image appears against a black, gray and white background. Each presents a perception problem. 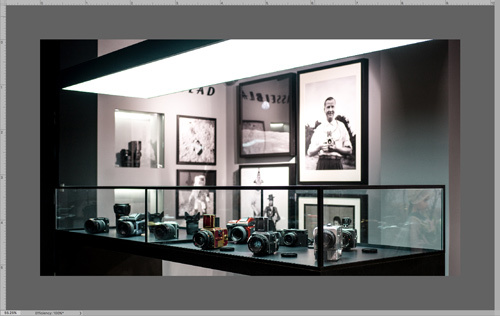 In the Black image, you can't distinguish the background in the image from the software's background. In the Gray image, everything looks fine. 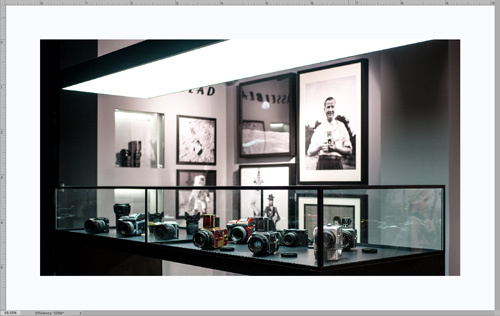 In the White image, you can't distinguish the overhead light from the background. And since we published it on a white background, that last was the most telling image. Our edit is represented by the fourth image in the set. We toned down the Whites a bit to distinguish the overhead light from the background. These days the default background color seems to be Black. But you aren't obliged to live with that. Most software offers alternative background options. Those may include Dark Gray, Light Gray and White. They may also include any color your system can generate. 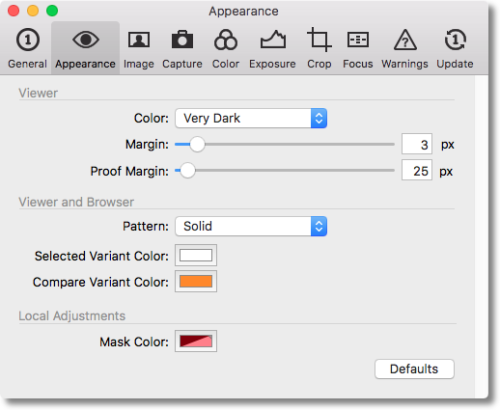 You might think the background color is just a preference (and indeed you'll find a few options for it in Preferences), but it should be set to match the environment in which your image will be seen. It doesn't make any sense to edit images destined for the white background of Photo Corners to be judged against a black background, for example. But don't feel you have to commit to a particular standard screen mode color. In fact, you may want to vary it for various output options or image content. Some applications make this pretty easy by enabling a contextual menu option to change the background on the fly just by clicking on it. In fact, let's take a look at a few popular applications to see what your options are. 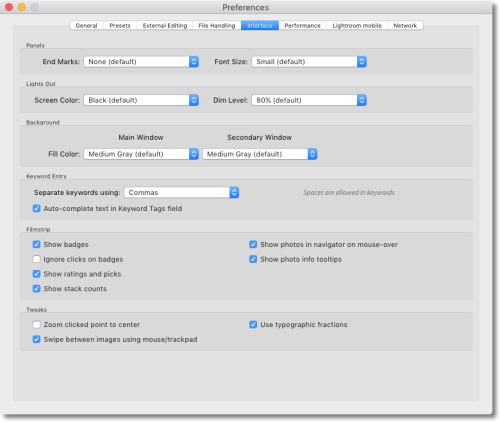 Capture One Pro lets you adjust the background in Preferences under Appearance. There are several options: Black, Very Dark, Dark, Medium, Light and White. 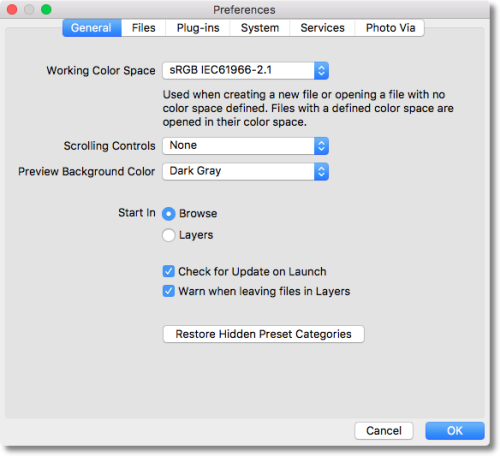 In DxO Optics Pro, you can set the background in Preferences under Display where you can click on the Image background color box to select any color at all. 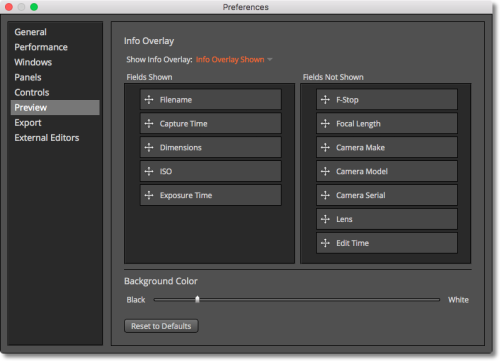 Exposure X2 has a Preview preference slider that runs from Black to White with no colors. You can get it it by Control-clicking on the background itself, too. 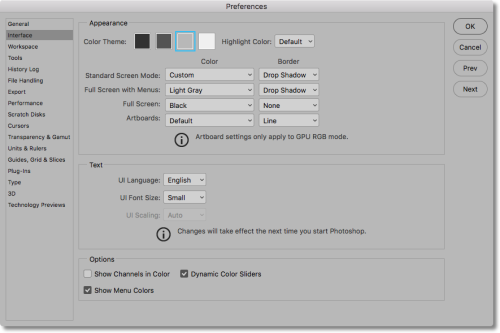 Lightroom's Preferences provides Fill Color for both a Main Window and Secondary Window in its Interface tab. But you can also switch on the fly using the Control-Click contextual menu, which offers Black, Darker Gray, Dark Gray, Medium Gray (default), Light Gray and White. In ON1 Photo Raw, General Preferences has a Preview Background Color setting with options for Black, Dark Gray, Light Gray, White and Custom (from which you can select anything on the color wheel. Apple Photos has a dark background but you can't change it. Why are we not surprised? In Photoshop, you can set the Full Screen Mode color in the Interface pane of Preferences or, as in Camera Raw, you can hold down Control and click in the background for a popup menu showing your options. You can also select your preferred screen mode color as the foreground color swatch in the Tool bar and Shift-click in the background area with the Paint Bucket tool to set it. That trick goes way back, so it works on older versions of Photoshop, too. Background options may not seem like much of a feature but they're far from trivial in helping you evaluate the tone and color changes you make to an image. And it's always wise to wonder if your judgement is being influenced by the environment.